Year after year, photovoltaic (PV) manufacturers strive to create more efficient solar panels through technological advancements and the utilization of different material. However, despite the recent efficiency gains, there still remains a simpler method to improve the overall effectiveness of these PV systems. For example, Aimtec’s new AM10/15/40W-800xxS-NZ DC-DC modular converters have an exclusive ultra-wide input range (200V DC to 1500V DC) that will create new efficiency gains ranging from 1.5-2% in comparison to the 1000V DC converters currently available on the market. Furthermore, Aimtec’s new DC-DC converters will allow a straightforward, cost effective and more compact design of the main electrical components involved in the harvesting of solar energy due to its innovative design and its seamless integration with Aimtec’s complete line-up of products. These benefits, in turn, will be passed on to the manufacturer through faster time- to-market, cost reductions and a more efficient system. In 2015, following the Global Climate conference in Paris, a carbon emission reduction agreement was signed which will fuel the development and popularity of green renewable energy like photovoltaic and wind power. Due to the heavy social support towards green renewable energy, the diminishing costs as well as the new efficiency gains, PV and wind energy systems are poised to be in very high demand. The ultimate goal for the PV industry is to keep increasing the efficiency of their panels through technological advancement and reducing production costs. To do so, they look for the latest off-the-shelf materials to make more efficient and cost effective panels. Currently, these systems are built on existing 1000Vdc input designs, which are 33% lower than Aimtec’s new 1500Vdc input design. In a report written by GTM, they calculated that these higher voltage systems would increase efficiency by 1.5 – 2% and would account for 9% of the global demand in 2016, equal to 4.6GW. Due to these findings, it is clear that the next step for PV would be to upgrade the internal components of the numerous devices contained within these sophisticated power systems. The AM10/15/40W-800xxS-NZ DC-DC converter is a unique product in the marketplace that has an input range from 200-1500VDC, a 4000VAC isolation and built-in multi-protection functions. These features can be used in various applications in the PV field as well as many other fields that require a stable and reliable power source (i.e. wind turbines). This innovative DC-DC converter allows the power module in the solar panel array to accept an input beyond 1000V, which is key since the output varies according to the sun’s intensity. If the output remains too high for extended periods of time, this may result in unstable operating voltage, wiring complications and single short-circuited problems, which can lead to whole system power failures. Furthermore, the block diagram of Aimtec’s DC-DC converter uses fly-back topology thanks to its mature and reliable PWM control IC. It also adopts the design of high voltage dual transistors in series and isolated power. Finally, the high-voltage start-up circuit employs Aimtec’s patented high-voltage start-up technology and has numerous protection circuits built-in. 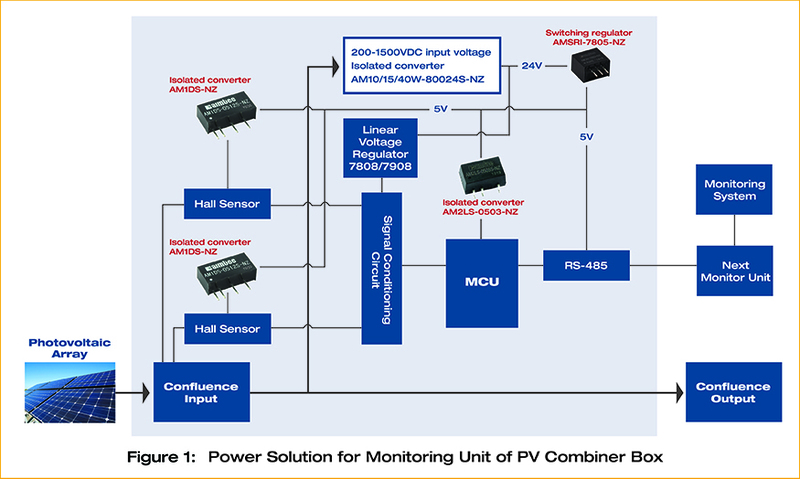 In this typical monitoring unit for the solar combiner box, the wide input range of the DC-DC converter and the 4000VAC isolation simplifies the process in converting the power from the solar array to the 24VDC that the monitoring unit requires. The DC-DC converter AM1DS-0505SH30-NZ is used to drive the hall sensor and offers isolation between the high and low voltages. The DC-DC converter AM2LS-0503S-NZ provides the 3.3V isolated voltage for the MCU. Finally, the RS-485 transceiver integrates the isolated serial communication signal and isolated power, which reduces electromagnetic interference and avoids ground loop interference. This solution is functional and meets the customer’s requirements while offering top tier safety. The combiner box is used to combine the current from the array, which then passes through the DC cabinet and gets converted to AC in the inverter. This inversion process needs to be monitored to make certain the inverted voltage meets the requirement. In the diagram, AM10/15/40W-800-NZ gets power from the high-voltage bus and reduces it to 24V DC. Next, the low-drop regulator AMSRI-7805-NZ and AMSRI-7815-NZ can provide the correct voltage with high efficiency for the upcoming circuit. AM2LS-0503S-NZ provides the 3.3V isolated voltage for the MCU. Aimtec’s new AM10/15/40W-800xxS-NZ DC-DC converter offers an industry leading input range from 200VDC to 1500VDC and is complemented by a complete range of products that will generate estimated efficiency gains of up to 2% for PV systems. Best-in-class safety mechanisms ensure safe and reliable operation of the equipment. Altogether, Aimtec’s PV solution brings great benefits to the customer by simplifying designs, reducing costs, and increasing system reliability.